A world’s fair called the Alaska-Yukon-Pacific Exposition (AYPE) took place on the campus of the University of Washington in 1909, which attracted interest in the development of northeast Seattle. At the time of the AYPE, infrastructure improvements including water, electricity, and streets were put into the University District but no farther out into other northeast areas. Some developers such as the McLaughlin Realty Company tried to attract buyers to Laurelhurst and Wedgwood but these areas remained rural because city services didn’t come in as quickly as the land speculators had hoped. At that time, 1909, there was no streetcar, bus service, city water or electricity out in Wedgwood. From its earliest years Wedgwood was an automobile neighborhood because of the lack of other transportation. To help meet the need, in 1926 the neighborhood organized its own private bus service called the Northeast Transportation Company. The neighborhood names “Wedgwood” and “Meadowbrook” had not yet been invented, and these areas were sometimes called Morningside or Maple Leaf. The word “northeast” seemed to best characterize the neighborhood and so it was chosen for the bus company name in 1926. 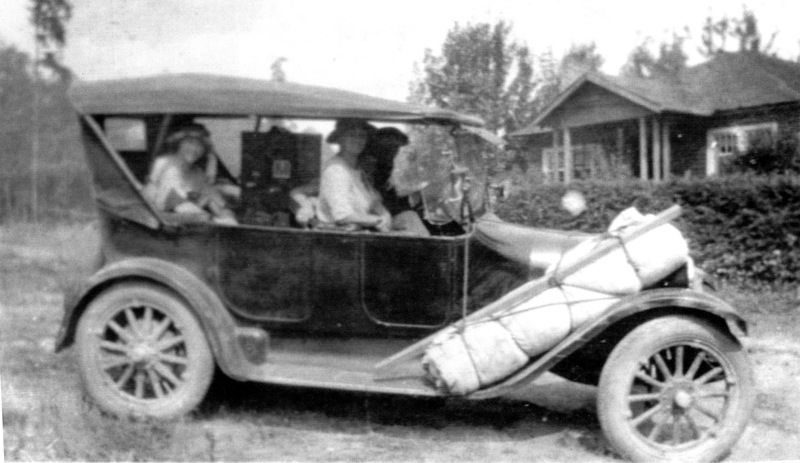 The Goodwin family of 3248 NE 89th Street were early car owners in Wedgwood. Photo courtesy of the Goodwin family. One of the earliest families in Wedgwood was Lores L. Goodwin and his wife Hanna. The Goodwins were shown on the census of 1910 living on “McLaughlin Tract Road,” which later was numbered NE 89th Street. Lores and Hanna had met at Washington Agricultural College (later called WSU) in eastern Washington. They came to Seattle in 1908 where Lores worked as a stenographer with one of the railways. In 1909 Lores obtained a good job with the Army Corps of Engineers. After the Lake Washington Ship Canal was completed, Lores worked the rest of his career as chief clerk at the Ballard Locks office of the Army Corps of Engineers. We do not know exactly why Lores and Hanna Goodwin chose to live at 3248 NE 89th Street in Wedgwood, instead of moving closer to the Ballard Locks where Lores worked. But they, like other young couples who were moving to the (future) Wedgwood neighborhood, may have been looking for a low-cost place to build their own home, with space for a garden and a chicken coop. We do know that the Goodwins were already owners of an automobile prior to 1910, which made it possible for Lores to commute from Wedgwood to Ballard to work. 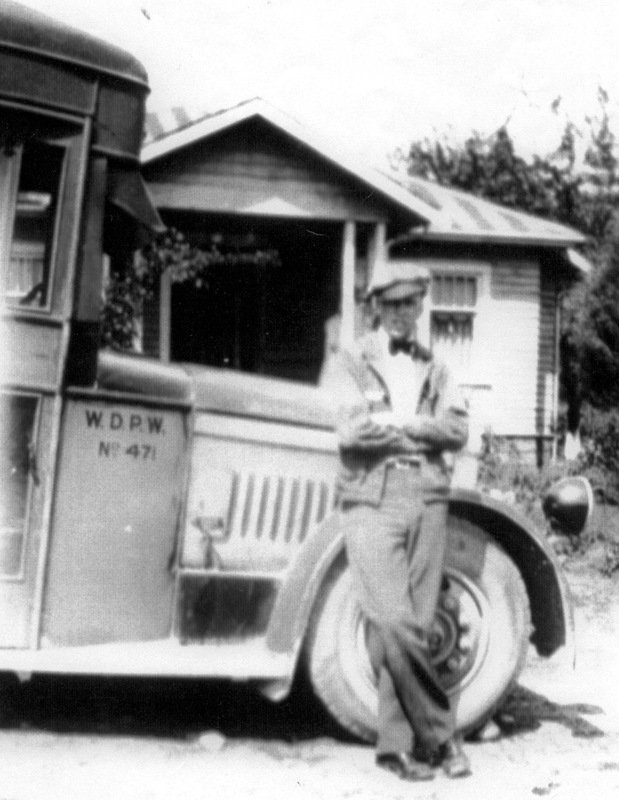 Forrest Goodwin, age 22, in a 1933 photo with the Northeast Transportation Company bus. The Goodwin family were real “neighborhood boosters” and were involved in early efforts to bring improvements to Wedgwood. They succeeded in getting city water and electricity to come in by 1926. In that year the Goodwins also launched a campaign to organize a private bus service. Hanna Goodwin was one of the women who went door-to-door, selling subscriptions. By July 1926 the bus service was fully organized as a corporation with some 250 shareholders, who subscribed from one to ten shares each of the capital stock. A subscription cost $1, and stock was an additional $3 per share. The bus purchased for the Northeast Transportation Company was kept at the Goodwin’s home and their son Forrest became one of the bus drivers. The Northeast Transportation Company bus route went north on 35th Ave NE as far as NE 110th Street, because Meadowbrook residents had also participated in the subscription campaign. Since the Meadowbrook and Wedgwood areas were outside of the city limits at that time, the bus continued south to NE 55th Street & Ravenna where people could connect with City of Seattle bus service. The fare was five cents. By the 1930s the fare was fifteen cents and the Northeast Transportation route had been extended to go all the way downtown. Because of the state restrictions on bus lines, Northeast Transportation could make several stops downtown but then made no more stops until it got to its prescribed route in northeast Seattle. Another one of the early bus drivers of the Northeast Transportation Company was Randolph C. Johnson, who was 28 years old when he began driving the bus in 1926. “Ran” Johnson had been born in Minnesota of Swedish immigrant parents who later settled in Seattle. After marrying in 1921 Ran and his wife Viola lived on 35th Ave NE near the intersection of NE 95th Street until they built a new house in 1930 at 4712 NE 100th Street, on the east side of Sand Point Way. Frank and Mary Hammond built a house on Lake Washington at NE 100th Street in 1918. Only two blocks farther east, on the shore of Lake Washington, was the home of Frank Hammond, an attorney, and his wife Mary, who had built their house in 1918. The Hammond’s first address listing was “LaVilla Station” which was the nearest mail drop at about NE 100th Street on the railway, the line of which is now the Burke-Gilman Trail. 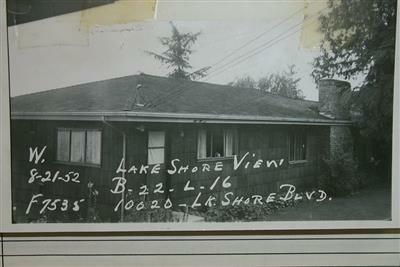 The Hammond’s house was later numbered 10020 Lake Shore Blvd. To get in and out from their house to Sand Point Way NE, the Hammonds had to drive right past the Johnson’s house on NE 100th Street. If they had known the conflicts the two men would come to in the later years of the 1930s, perhaps the Johnsons would not have built their house on that street. Before joining Northeast Transportation in 1926 Ran Johnson had worked for another company, where he began his life-long work with mechanics and bus service. By 1937 Ran was superintendent of Northeast Transportation and he tried to establish ownership, claiming that he had purchased the stock of the company. As a result of the dispute as to who really owned Northeast Transportation, the directors of the company dismissed Ran Johnson on January 1, 1938, and litigation commenced. Attorney Frank E. Hammond was named manager of the bus line. Two factions, one headed by Ran Johnson and one by Frank Hammond, began a series of legal maneuvers for control of the Northeast Transportation Company. For the next five years, the dueling factions brought cases to court and applications to the State Department of Public Works for the right to operate bus routes in northeast Seattle. Upon his dismissal Ran Johnson immediately started his own bus service, taking with him three buses which formerly had been used for the Northeast Transportation Company. Each of the two companies would leapfrog one other at bus stops along 35th Ave NE and would try to get passengers to go with their line. The neighborhood took sides, with some people only riding with the bus they favored, and refusing to ride the bus of the rival company. Things heated up when, on January 22, 1938, three of Ran Johnson’s drivers were arrested. Patrons of the Johnson line waited downtown at Third & Stewart Street for over an hour, refusing to ride on Northeast Transportation, while arrangements were being made for the release of the Ran Johnson drivers. Two days later a group of seventy-five women stormed the office of the King County Prosecutor, interceding for Ran Johnson and his bus drivers. The prosecutor explained to the group that he could not interfere with court action, and that the women should put their case before the State Board of Public Works in Olympia, which had the power to grant licenses for transit line operations. On January 29, 1938, the Northeast Transportation Company operated without competition. Ran Johnson, threatened with arrest because he did not hold a certificate to operate his bus line, temporarily stopped his competing service. On February 17, 1938, the State Department of Public Service came to Seattle to hold hearings on the matter of granting a certificate of operation to Ran Johnson. The hearing was attended by more than three hundred people, and there were even more people who couldn’t get into the room. Attorneys representing Ran Johnson put nearly fifty north Seattle residents on the stand to give testimony, and presented petitions bearing 1,817 signatures asking that the certificate of operation be given to Johnson. As one of the original organizers of the company, Lores Goodwin was put on the stand by both Johnson’s attorneys and those representing Frank Hammond and Northeast Transportation. Probably wanting to keep peace with all neighbors, no matter which side they were on, Goodwin diplomatically stated that everything had seemed to run well while Johnson was in charge of Northeast Transportation, and that he (Goodwin) was not currently on the board of management. On April 23, 1938, the State Department of Public Service ruled in favor of Ran Johnson, that the authority to operate the Northeast Transportation Company should be awarded to him. But the legal battles weren’t over; for the next two years each side took the issue to court. Different judges issued contradictory orders so that at times, one company operated and then the other. The two rival factions continued seeking control of the bus service. In the interim, neighborhood groups split into competing “social clubs” so that by the summer of 1938, the Morningside & Northeast Social Club had started operating another bus, which was leased from Ran Johnson because a different court order had turned operation of Northeast Transportation back to the Frank Hammond group. On July 20, 1938 in Superior Court, the Northeast Transportation Company sought a restraining order, claiming that the Morningside & Northeast Social Club was a subterfuge, formed for the purpose of providing bus transportation cheaper than Northeast Transportation could afford to do. Apparently fed up, the judge in the case said he had no time to complete the hearing and that a court would not be available until September, after summer vacation. On August 4, 1938, a different Superior Court judge granted the Northeast Transportation Company a temporary injunction against the Morningside & Northeast Social Club. The order, pending a hearing of the case on its merits, barred nine hundred Morningside residents from riding on the two buses which they rented from Ran Johnson. In the midst of the bus company squabbling, others saw the opportunity to invade the territory. In November 1938 the Department of Public Service granted a permit to L.A. Varekamp, a Seattle bus operator, to extend passenger-bus service from Ravenna to NE 95th Street and all along Sand Point Way NE. A year later, on December 8, 1939, President Franklin D. Roosevelt declared a national emergency in response to the outbreak of World War Two in Europe, and this order impacted all of life in northeast Seattle. Federal money was allocated for the build-up of Sand Point Naval Air Station (founded in 1920) and by the summer of 1940 there was a sharp increase in military and civilian workers, which caused an increase in nearby housing. Greater population density around the Sand Point area made it well worthwhile for a bus route to operate there. Soon other area groups, such as the 15th Avenue Northeast Improvement Club, Sand Point-Ravenna Improvement Club and Hayes Park-Ravenna Community Club began asking for bus service, as well. Each group specifically mentioned complaints and objections to the fares, schedules and equipment of the Northeast Transportation Company. It was up to the State Department of Public Service to extend bus service to areas northeast of the city limit. (East of 20th Ave NE, the city limit was at NE 65th Street.) In July 1940 the Department ordered the Northeast Transportation Company to make certain improvements in its services. Later that month the company’s certificate of operation was cancelled “for failure to keep its equipment up to standard.” The final complaint against the bus company was filed by the Maple Leaf Improvement Club. At that time “Maple Leaf” meant the group which met in the former schoolhouse, a wood-frame building on 35th Ave NE at the southeast corner of NE 105th Street, and was the neighborhood name before “Meadowbrook” came into use. Incredibly, the factions, one led by Frank Hammond and the other by Ran Johnson, continued to fight on into 1942, the fifth year of the bus company dispute. The Superior Court had, in December 1941, ordered that the Northeast Transportation Company be sold to the highest bidder to pay the firm’s obligations. A powerful contender, Roy Furse, was the successful bidder. Ironically, he was the former superintendent of Seattle’s streetcar system which had gone out of business, superseded by buses and cars. By the 1940s Roy Furse was in his early sixties but he was still vigorous; he would live to be over ninety years old. In 1941 Furse was already operating bus lines south and north of Seattle called Suburban Transportation, and that name was then applied to the former Northeast Transportation route. The auto repair shop at 9702 Sand Point Way NE was founded by Ran Johnson in 1939. In 1942 Ran Johnson continued unsuccessfully to try to get back control of the area which had been served by the Northeast Transportation line, while also successfully operating his Sand Point Bus System. In the midst of everything else he was doing, in 1939 Johnson had opened a gas station and automotive shop at 9702 Sand Point Way NE. Johnson worked there and also used it as a base for his buses. The original building has been replaced, but the site is still a car repair shop today. The claims and court cases of Ran Johnson and Frank Hammond ended in 1943 with the deaths of both men that year. Ran Johnson’s newspaper obituary of April 18, 1943, was several columns long and reviewed his career as a much-beloved bus driver. It was noted that the increase in northeast Seattle population during the early 1940s, especially in the vicinity of the Sand Point Naval Air Station, had created a large enough customer base not only for Ran Johnson but for several other bus lines as well. Johnson had died of a heart attack at only 45 years of age, and his obituary speculated that the strain of hard work hastened his death. He would customarily start the day’s first bus run at 6:45 AM and he finished his last trip after 9:30 PM. It was not unusual for him to work on bus maintenance for some more hours after that. In November 1943 Frank Hammond died at the age of 62. Only a brief death notice appeared for him in the newspaper, noting his age, surviving family members, and that he had belonged to a fraternal order. Why was the bus lawsuit such a big controversy in the 1930s? From the distance of more than eighty years since the events occurred, it is hard for us to understand why the residents of Wedgwood and Meadowbrook got so riled up about bus service in the 1930s. Some of the factors were the era of economic depression that they were living in, and how northeast Seattle residents felt about the autonomy of the neighborhood and unwanted government interference. From earliest years Wedgwood-area residents were “do-it-ourselves” people. Many were willing to live without electricity and other city services, in order to find a place where they could afford to have their own homes. Residents felt that they had little, and what they had was essential. The disruptions in bus service seemed to be “the last straw” in a time of economic stress during the 1930s. It can be noted that the women of the neighborhood were the most concerned about the bus service, as it was the only way for them to get around independently. There was no such thing as a “two-car family” in Wedgwood in the 1930s. Families who had a car, had just one car which the man of the house used to drive to work. The Maple Leaf School at 3212 NE 100th Street was completed in 1926. The community was proud of their efforts to build their own school, which was in an independent district outside of the Seattle City Limits. Like the Goodwin family, many Wedgwood and Meadowbrook residents were activists and volunteers in the neighborhood. Residents had organized their own school district in 1910 and built a wood-frame Maple Leaf School on 35th Ave NE at the southeast corner of NE 105th Street. In 1926 (which seemed to be a big year for neighborhood development) Meadowbrook farmer August Fischer donated land at NE 100th Street & 32nd Ave NE for the site of a new school. A new brick Maple Leaf School building was constructed there in 1926 by a respected neighborhood resident and contractor who had arrived in 1913, Bill Lovell, and his son Ellsworth Lovell. The women of the district began providing a hot lunch at the brick school during the economic depression years of the 1930s, when it became apparent that some children were coming to school hungry. The Wedgwood and Meadowbrook neighborhoods were proud of the do-it-ourselves bus company which they had organized in 1926 and felt that, since they were outside the city limits, city and state governments should not hinder the operation of Northeast Transportation unnecessarily. The January 1, 1938 ousting of Ran Johnson by a board of managers headed by an attorney, Frank Hammond, seemed like a case of do-nothing bluebloods versus Ran the working man. Public attitude was that the bus service “Ran” just fine, thank you, so please don’t get in the way. Ran Johnson became a kind of Robin Hood figure in that he was seen as bringing benefits to the neighborhood, despite the efforts of the powers-that-be to take him out of service. Ran was well-known to women of the neighborhood for his courtesy, for knowing the names of all the children, and for sometimes diverting from the route to deliver a mother with children right to the door of her home. The Prohibition years (ending in 1934) and the economic depression of the 1930s changed the attitudes of many Americans towards formerly-respected figures such as bankers, lawyers, government and law enforcement. It seemed like government was either interfering too much (Prohibition) or was not doing enough (little to no solutions or aid during the early years of the Great Depression.) For these reasons some people deliberately chose to live outside of the Seattle city limits where there would be less government involvement, and they didn’t want state officials to regulate what kind of bus system they could have. From our perspective of eighty years later, it does now seem to be an unreasonable “restraint of trade” for the State Department of Public Service to only allow one bus line to run on a route. The easier solution would have been to allow free competition and let the market sort out the winning bus company. 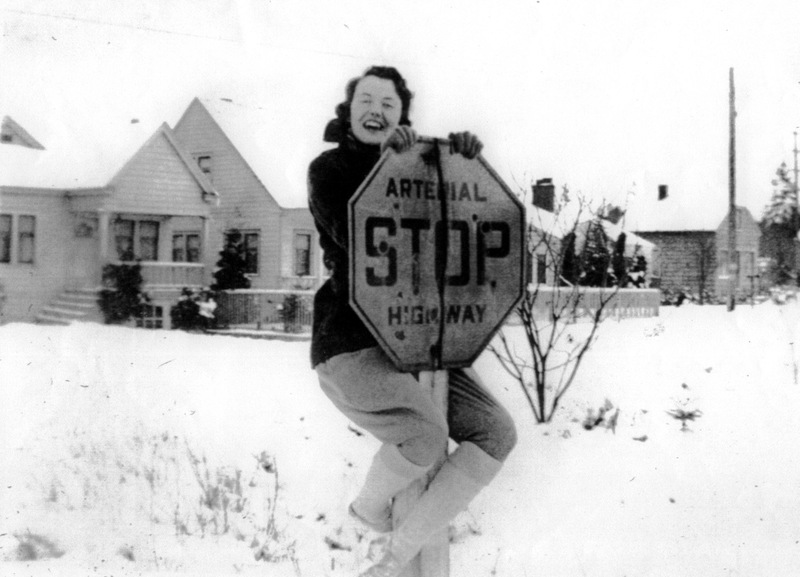 Vivacious Delores Goodwin, age 17, clowns around on the NE 89th Street stop sign in this photo taken on January 19, 1935, marking the arterialization of 35th Avenue NE. The house in the background is at 8816 35th Ave NE, built in 1926. In those 1930s years, northeast Seattle’s development had been slow and the area was still semi-rural. Then in the run-up to the USA’s entry into World War Two in December 1941, the population of northeast Seattle swelled with war workers. Few people seemed to realize what would happen once the war was over: there would be a sudden rush of young men coming back from the war to find jobs, wives and new lives, and this population boom would create stresses and pressures on every aspect of society. The Wedgwood neighborhood in northeast Seattle took on its identity in the late 1940s after Balch began building housing developements. Postwar residential growth and commercial development would have a major impact throughout northeast Seattle because it was an area where there was still so much available vacant land. Developers such as Albert Balch, the “father” of the Wedgwood neighborhood, created new housing developments catering to young families. Rapid postwar development would change the landscape in Wedgwood, and these changes would be embraced by some residents and resisted by others. The postwar period from 1945 to 1955 would feature Wedgwood’s next big controversy: whether or not to come into the City Limits of Seattle. There would be plenty of strong opinions on both sides of the annexation issue, and the 1930s bus company conflict would recede from memory. This entry was posted in Controversies, name of the neighborhood, School histories and tagged Neighborhood History, northeast seattle, Seattle, WPLongform. Bookmark the permalink.